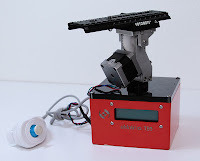 The new release of GBTimelapse (version 3.8 and above) enables control of an eMotimo TB3 pan/tilt. Instead of using the TB3 'shoot-move-shoot' method, GBTimelapse controls the camera settings and tells the TB3 when to move. If you already own GBT 3.x, just download this new release. With GBTimelapse in control of the eMotimo, the software's AutoRamp feature gives you fantastic, high end time-lapse results like the examples below. The second and third clips show the TB3 in action. AutoRamp isn't just for a Holy Grail shot (sunrises and sunsets that span huge exposure changes). Panning 180 degrees can require two stops or more change in exposure. GBTimelapse AutoRamp can automatically adjust the camera settings and bulb time to maintain a perfect exposure through the pan range. With the camera shutter and PC/Flash cables connected to the TB3, you can use bulb durations as short as 33 milliseconds allowing full daylight-to-Milky Way time-lapse with only a 4-stop filter. It's a simple matter to install the GBTimelapse firmware in the TB3. Just use the included GBUploadFirmware program to quickly switch between GBT and the original TB3 firmware. Set your start and end points while watching live-view on the computer screen. Save your pan/tilt move in the project file to repeat again some other day. Change your pan/tilt end point in real-time during time-lapse capture. Watch your time-lapse as a movie preview while it is being captured. GBTimelapse's new pan/tilt feature also works with the eMotimo TB3-Black and Directed Perception PTU-D46. The PTU-D46 is an industrial strength unit that costs a bit more. Thanks, you guys that is a great explanation. keep up the good work..